Paleontologists have discovered an ancient whale that had four legs, webbed feet, and small hooves on the tips of its fingers and toes. The creature, named Peregocetus pacificus, had sharp teeth for hunting fish and could both walk on land and swim in the sea. A new study about this whale ancestor may force scientists to rethink how these creatures migrated 40 to 50 million years ago. Ancient whales, the study authors suggest, crossed the Atlantic Ocean from Africa and swam to South America before traveling north. At first glance, the four-legged creature above might seem like an otter or a platypus. But in fact, it's an ancient, 13-foot-long whale that lived 42.6 million years ago. In a new study published in the journal Current Biology, paleontologists have documented their discovery of this whale ancestor, whose skeleton was unearthed in Peru in 2011. 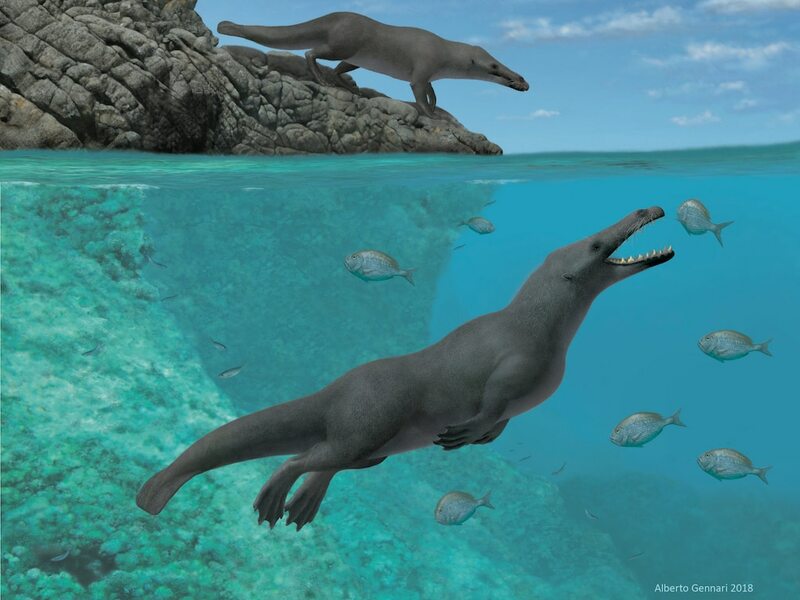 Named Peregocetus pacificus, which means “the traveling whale that reached the Pacific” in Latin, this recent finding is upending scientists' understanding of how these creatures evolved and spread around the world millions of years ago. » Were the Romans the first whale hunters?